TRUNK ORGANIZER FOR YOUR 2 CENTS? What do you like, or don’t, about this newsletter? Georgia Wild’s annual survey is a great way to tell us. Taking part could even help simplify your life. Here’s how. 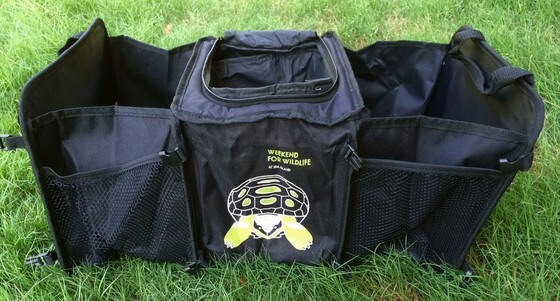 Complete the survey, provide your email (it’s one of the questions) and you’ll be in the drawing for one of five Weekend for Wildlife trunk organizers. The organizers have a cooler in the middle and a nifty gopher tortoise on the outside. Organize your ride and make Georgia Wild a better read. Everybody wins, right? Please complete the survey by Sept. 16. Winners will be notified by Sept. 23. The trunk organizer drawing is not open to DNR employees. A singularly odd spider has been documented in Georgia by a Statesboro man. Until last year, the ogre-faced spider (Deinopis spinosa), essentially a subtropical species, had only been recorded from extreme southern Alabama, Florida and Jamaica. But during the summer of 2015, Matt Moore, an avid student of spiders and snakes, found a population of ogre-faced spiders near his home in Bulloch County. A review of the literature and checks with spider experts in Florida and Washington, D.C., confirmed these were the first specimens of Deinopis spinosa recorded in the state. Moore’s remarkable find extended the known range of this arachnid about 150 miles north of the closest known site in north Florida. Fast-forward to this July. Moore again documented ogre-faced spiders at the site near Statesboro. He also discovered populations at Altama Plantation Wildlife Management Area in Glynn County and on the Orianne Indigo Snake Preserve near Lumber City in Telfair County. Future surveys could show that this spider is widely distributed throughout much of the Coastal Plain region of southern Georgia. Ogre-faced spiders, also called net-casting spiders, are members of a very odd family (Deinopidae) that have evolved a unique web structure. Emerging just after dark, these spiders build a silk scaffold a few feet off the ground and then hang from the web head-down. They also spin a capture net of fluffy silk, which, analogous to a fisherman’s cast-net, they hold stationary in their front four legs. 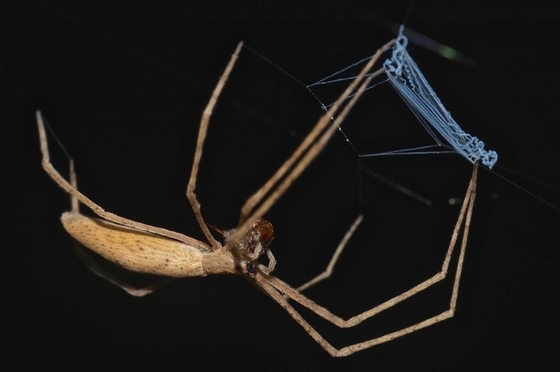 When an insect walks or flies near, the spider lunges to enfold the prey in its net (watch). No other spiders share this hunting strategy. Ogre-faced spiders are “sight hunters,” and have unusually large, forward-facing eyes (with the capabilities of a fish-eye lens) that give them extraordinary night vision. Their eyes, however, are not functional during daylight conditions, making the spiders solely nocturnal. 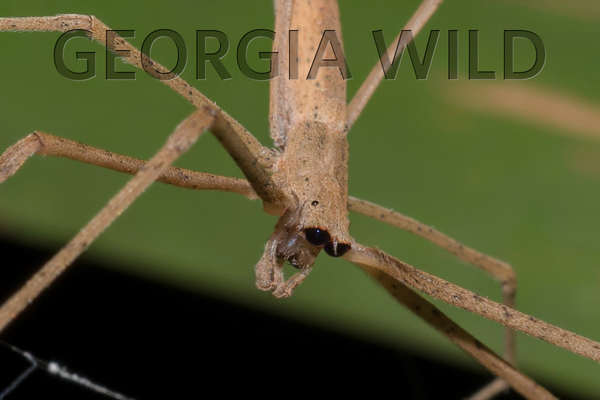 The species’ strictly nocturnal activity – they’re typically spotted on palmetto fronds or the foliage of shrubs, 1-4 feet off the ground – likely explains the lack of specimens known from Georgia. Ogre-faced spiders are named for their fearsome looks, including two large eyes (not counting the six smaller ones) and long fangs. Georgia Plant Conservation Alliance botanists from Atlanta Botanical Garden and DNR’s Nongame Conservation Section found more than just four flowering stems of the state-threatened white fringeless orchid when we teamed up this month to monitor a naturally occurring population of the rare orchid at Pine Log Wildlife Management Area. We also found a rarely seen reptile that hadn’t been seen at Pine Log before. Basking atop a sun-bleached log in the middle of the wetland was a diminutive, shiny black lizard about 3-and-a-half inches long. I couldn’t believe our luck: The lizard was a southern coal skink, the same subspecies I’d seen for the first time only four months earlier at Paulding County’s Sheffield Wildlife Management Area. That discovery on state land was a county record and a significant range extension for Plestiodon anthracinus pluvialis. The find at Pine Log in Bartow County was as well. Coal skinks are relatives of the more familiar five-lined, southeastern five-lined and broadhead skinks regularly seen in suburban and remote areas of the state. The predicted range in Georgia of the coal skink, a species infrequently encountered and poorly understood, has included the Blue Ridge, the extreme northeastern Piedmont and a disjunct area of Georgia’s northwestern Coastal Plain. 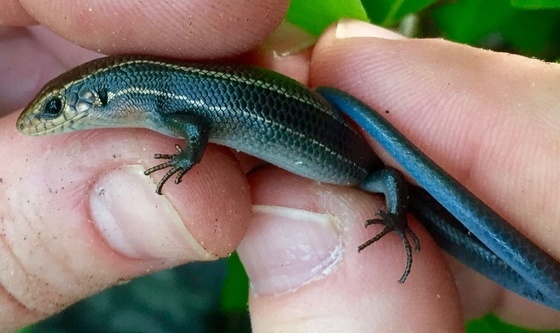 These new Piedmont and extreme southwestern Blue Ridge findings suggest that undetected populations exist between the mountains and Coastal Plain and perhaps in the Ridge and Valley, with possible intermingling of the southern and northern (P. a. anthracinus) coal skink subspecies. DNR biologists will be on the lookout for more of these secretive skinks, particularly on protected state lands managed for rare wildlife and plant species. Rebecca Byrd is a botany technician and herp enthusiast in the Nongame Conservation Section. If you missed last week's special e-newsletter issue, you might not have heard that one of Georgia's most popular and wildlife-friendly license plates is coming back. You can now buy a redesigned plate featuring a bald eagle and the American flag through county tag offices. The eye-catching image is a throw-back to DNR’s smaller eagle-and-flag design sold from late 2003 to 2013 and still common on cars and trucks. That design raised millions to help conserve Georgia wildlife not legally hunted or fished for, as well as rare plants and natural habitats statewide. The hope is the redesign does the same. Of course, some counties still have the previous soaring eagle plates in stock (pictured at the end of this newsletter). If you want one, check soon with your local tag office. Once these popular plates are gone, no more will be produced. Like DNR’s other plates, eagle tags cost only $25 more than a standard Peach State plate to buy or renew (not including registration fees required for all tags or applicable ad valorem taxes). Most of that specialty plate fee – up to 80 percent – is dedicated to wildlife. Renewing a tag also provides the same solid support. 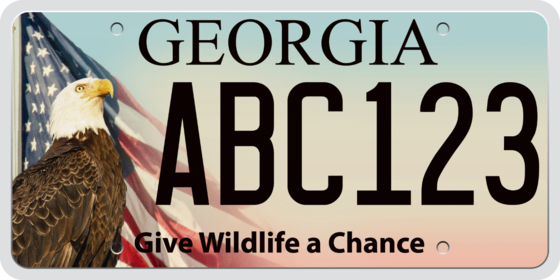 Add an eagle plate and give Georgia wildlife a chance! Learn more. Brahminy blind snakes have a tail-hold in Savannah. Artist Hannah JS Davis recently found and videoed the non-native species at her home near Ardsley Park – where a Brahminy has turned up before. The finds suggest an established population of the worm-like, non-venomous species from Asia, DNR senior wildlife biologist John Jensen said. Not that more than one is needed: All Brahminy blind snakes are female and parthenogenic -- they self-fertilize their eggs and reproduce on their own (“Blind snake worms way onto coast,” May 14, 2013, and a correction, May 31). DNR public fishing areas will be open seven days a week again starting on Labor Day. Popular for fishing, birding, hiking and other outdoor activities, PFAs had been closed Mondays and Tuesdays for the last five years following budget cuts. 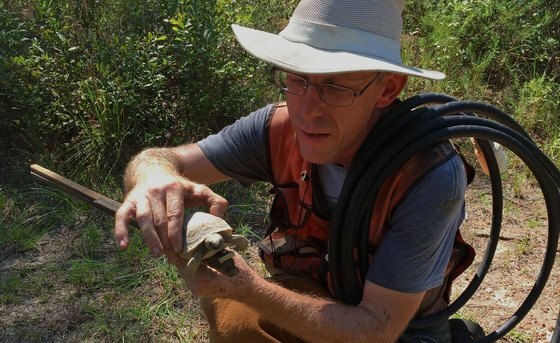 Matthew Stoddard (above) of DNR’s gopher tortoise survey crew measures a young tortoise found crossing a road near Bullard Creek Wildlife Management Area. During four days of survey work at the WMA near Hazlehurst, the crew found more than 20 tortoises, ranging from juveniles to adults. Prescribed fire is helping restore species statewide. Recent examples include a 33-percent increase in seedlings of rare eastern turkey beard at Dawson Forest Wildlife Management Area near Dawsonville and, after a June burn at Doerun Pitcherplant Bog Wildlife Management Area in Colquitt County, rapid growth of three types of milkweed and “very happy wiregrass,” according to DNR biologists. Recent video of a cougar in west-central Tennessee marks the seventh confirmation of a mountain lion in that state since September 2015. Tennessee’s wildlife agency said sightings likely reflect a range expansion – not population establishment – of cougars recolonizing the Midwest and wandering even farther. Even fish photo bomb. 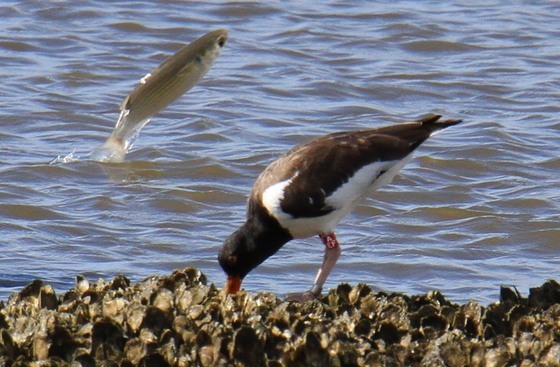 This striped mullet (above) made a splash as Nongame Conservation biologist Tim Keyes photographed a banded American oystercatcher on an oyster bed off Little Egg Island this month. Names in the new: The Athens elementary school teacher who received DNR’s Conservation Teacher of the Year grant in 2013, Steven King, has been chosen this year to receive a Presidential Award for Excellence in Mathematics and Science Teaching. An article by DNR senior biologist Nathan Klaus in the summer Longleaf Alliance magazine issue (available online Oct. 1) describes his research on using new technology to measure duff moisture and resulting opportunities to burn fire-suppressed, old-growth longleaf forests. DNR Law Enforcement Division named Cpl. Eddie Tompkins its 2016 Ranger of the Year and Cpl. John Evans the runner-up as recipient of the James R. Darnell Award. Tompkins, selected Georgia Boating Officer of the Year in 2015 for his work on Lake Lanier, is assigned to Gwinnett County and Evans to Glynn. Ranger 1st Class Michael Crawley, Sgt. Damon Winters and Capt. Chris Hodge have been nominated for the Peace Officers Association of Georgia’s annual Valor Award.